Green Lynx spiders, like all others in the Family Oxyopidae, are diurnal, that is they hunt during daylight hours. Their hunts are conducted much like those of the jumping spiders (Salticidae); they roam low foliage looking for prey. Their eyesight is not as keen as the jumping spiders, and they more often use the “wait and pounce” hunting tactic most often associated with the (equally well) camouflaged crab spiders. Oxyopids of North America are characterized by the presence of numerous large, erect spines on the legs and their erratic and sudden movements. 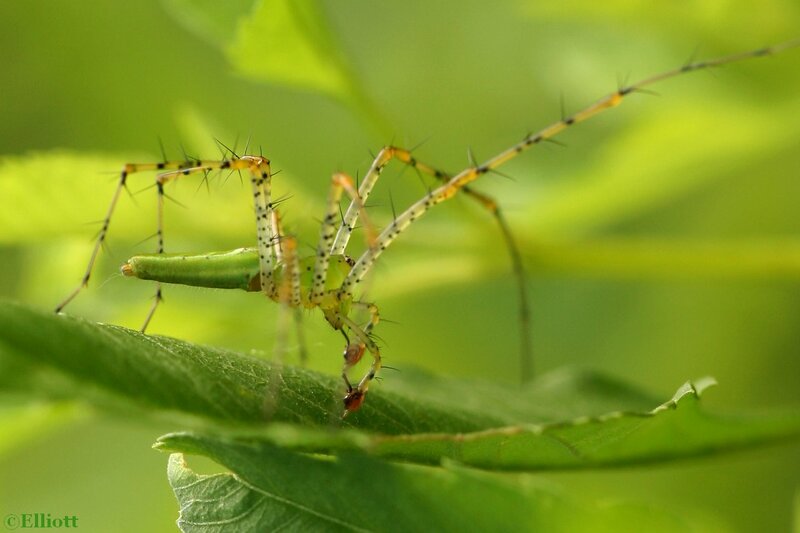 The green lynxes, like other Oxyopidae, are diurnal hunting spiders which run over low shrubs and herbs with great agility, leaping from place to place with a precision excelled only by jumping spiders. Their keen eyesight is comparable to that of the wolf and fishing spiders. 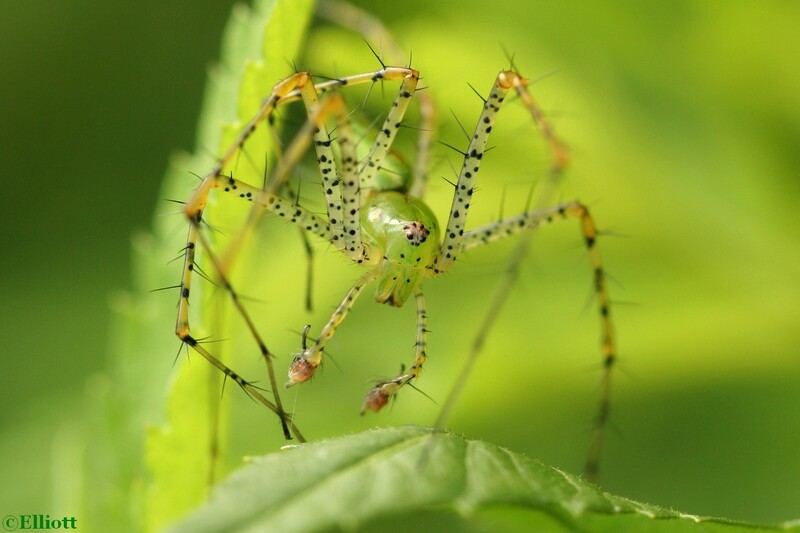 Studies have shown the green lynx spider to prey on many species of insects, with bees & wasps in the Order Hymenoptera being the most common, comprising over 40% of all captures. 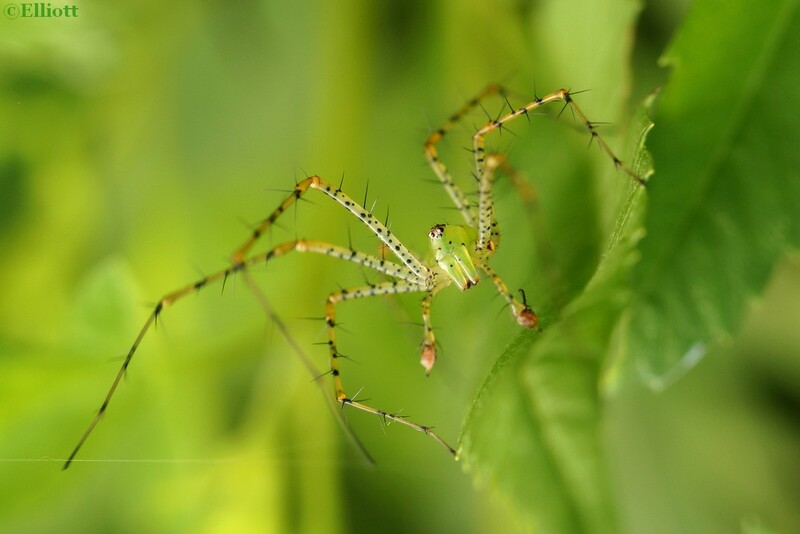 Little is known about the chemistry of the venom, but it has been discovered that P. viridans, alone among spiders, is capable of spraying its venom up to 20 centimeters (about 3/4 inch). Nothing is known about the defensive effectiveness of this procedure, or whether the spider also uses it offensively. Lynx spiders are among the major predators occurring in low shrubs and herbaceous vegetation. Few detailed observations have been made on the feeding habits of lynx spiders, but investigations by W.H. Whitcomb have discovered they are important predators of crop-damaging insects. Oxyopes salticus, one of the most common lynx spiders in Arkansas cotton fields, has been reported as a predator of the cotton bollworm. 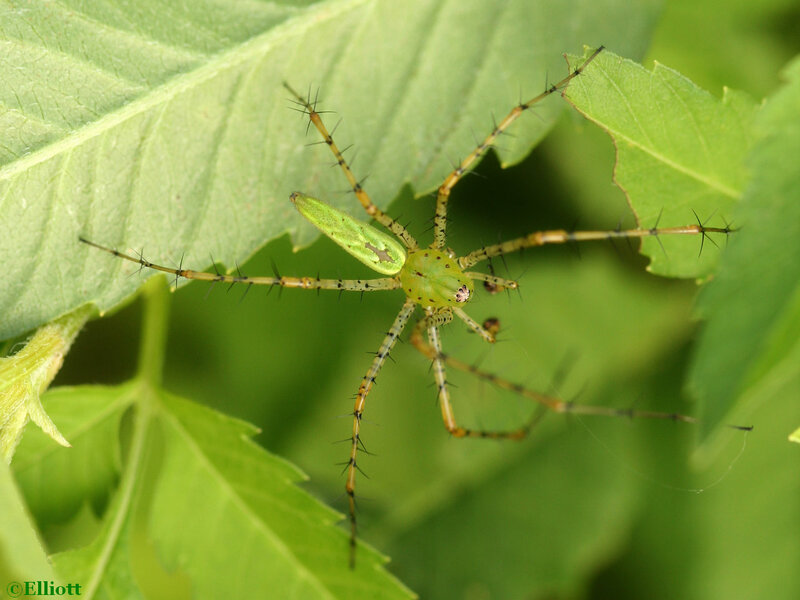 Green lynx spiders have been observed feeding on many species of moths of the families Noctuidae, Geometridae, and Pyralidae, including some of the most important crop pests. However, their usefulness in the control of insect pests is counteracted by their propensity to prey also upon beneficial insects. These spiders seize large numbers of honey bees, as well as sphecid and vespid wasps. Whitcomb reported that members of the vespid genus Polistes which are important predators on crop pests, are especially favored as prey by lynx spiders. Similarly, several species of Diptera, including syrphid flies (pollinators) and large tachinid flies (beneficial parasites), also are eaten. H.V. Weems, W.H.Whitcomb, Florida Dept. of Ag and Consumer Services, Entomology Circular 181. North American Insects & Spiders is dedicated to providing educational resources for our users through use of large macro photographs of flora and fauna in their natural habitat.